Don’t forget the Catholic Marketing Network Trade Show Selfie Scavenger Hunt! Not only is this week the Catholic Marketing Network Trade Show and Catholic Writers Conference Live, but it’s also National Natural Family Planning Awareness Week. 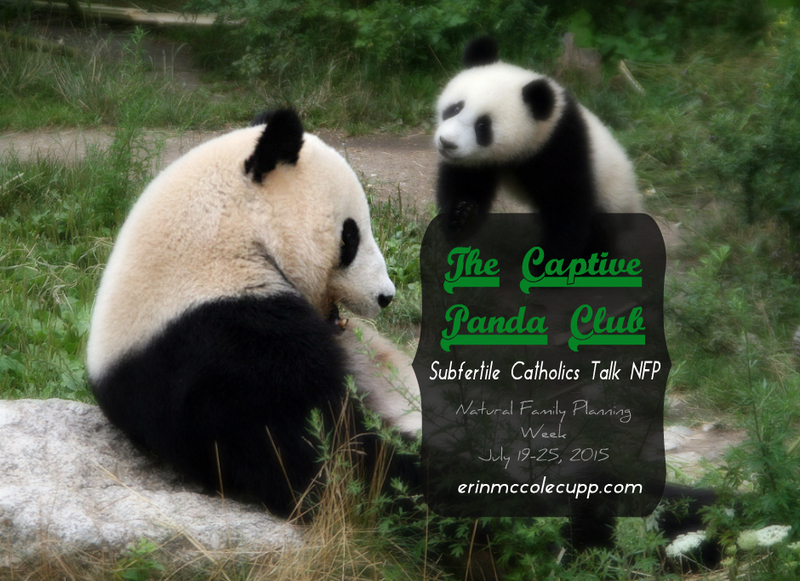 I’ll be away at the show/conference, but I’m hosting postings from a few fellow members of the Captive Panda Club: those of us follow Church teaching on fertility but who nevertheless bust that super-fertile Catholic stereotype and get and stay pregnant as often as your average captive panda. 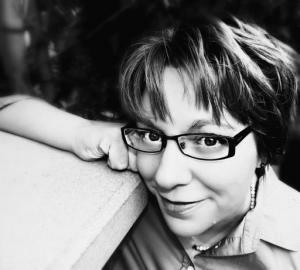 Today’s guest blogger is ME! Oh, come on. You people know me. Now learn about life in the Captive Panda Club, better known as our journey with subfertility. I’d always had problem periods, from the second one on. In college, even while not practicing any real faith, I considered asking for The Pill, but something very visceral stopped me. I knew that it caused early abortions and wasn’t super comfortable with that, even as a nice, friendly agnostic. However, there was something deeper still that I can’t name that stopped me. Maybe it was because my uncle’s girlfriend died of blood clots (Pill-induced, everyone guessed, as if to say, “Oh, well. That’s a shame”). I didn’t believe in God but was still frightened of meeting him on bad terms, so I wasn’t eager to sign up for anything life threatening. When I did get married, we used NFP to avoid for a little over a year, thinking we needed to get our footing as a couple before we added another person to the mix. But then once we started throwing caution to the wind, we went five years without anything but that one time there was an extra shadow on a HPT. The next day I got my period. In those years, we went to doctor after doctor, none of whom were Catholic (or not practicing, at any rate), all of whom ended up saying, “There’s nothing we can do for you.” None of them knew how to heal. Frankly, it felt like none of them knew how to care. Finally, while getting ready to adopt, we found ourselves spontaneously pregnant with twins. After another six years of trying and one endometriosis surgery with a Fertility Care doctor, we spontaneously conceived our Second Shift of Kid (just one this time). We have again been trying for another five years. That Fertility Care doctor has since retired, and I’m having trouble finding a doctor who will perform surgery, much less treat me consistently without having to harp on me about my weight at each interaction (like I don’t know it’s there or something). I’m trying some new things with my health, though, and may go up to the Gianna Center in New Brunswick, NJ when it becomes a little more feasible with the family schedule. How is the experience of subfertility is different from infertility? How has NFP helped with health and our marriage? Be honest: how has NFP made life less-than-easier? On the one hand, I don’t feel right saying it hasn’t made my life easier, because I now see those friends who didn’t understand why we wouldn’t try IVF have tried it themselves and come out of the experience much poorer and still childless. While IVF might have seemed easier, I now see NFP has protected us from a lot of pain, both physical and spiritual. What is hard, though, is how hard it is to get help with NFP. It’s hard to find a doctor. It’s hard to find a practitioner. And, um, hello? It’s 2015 and there STILL isn’t a Creighton Model app? Not cool, Pope Paul VI Center. Not cool. What is one thing I wish people knew about being a subfertile Catholic? I remember when I told a certain family member that we were pregnant with twins, he said with great doubt in his voice, “And how did that happen?” I’d been so vocal about the, forgive the word those of you who are sensitive, evils of ART/IVF, that when I was suddenly pregnant with multiples, I got the sense that people were assuming we had become big, fat, desperate hypocrites. At first that freaked me out, but what kept me from trying to defend myself was the knowledge that everybody who knew Mary probably thought she was a big, fat hypocrite too when she showed up unmarried and pregnant. So if that humiliation was good enough for the Mother of God, then I was not in a position to whine—or defend myself. Okay, one more thing: as a Catholic homeschooling mom, I feel a sharp twinge every time I go to an outing or somebody’s house and have to park my Prius in line with all the sixteen passenger vans. Nobody ever says anything to me about it, but I often wonder if they think I’m CINO. Again, gotta go back to Mary for that. Reader, do you have an experience with subfertility to share with your fellow Captive Pandas? Did you go from infertile to subfertile, experience secondary infertility, or experience a different path all together? What’s the hardest part of being a Captive Panda Club member? What keeps you going in faith? How has God sustained you through it all? What have been some unexpected blessings you’ve found as a result of trusting in Church teaching on fertility? Talk to us in the comments below! PS: Don’t forget the Catholic Marketing Network Trade Show Selfie Scavenger Hunt!